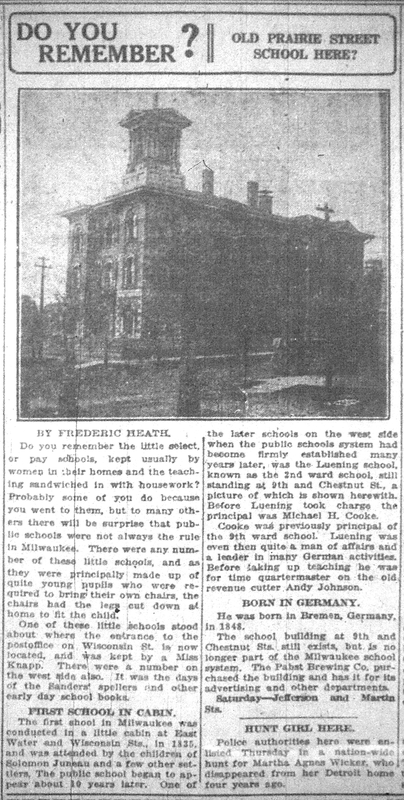 This is another article in the series written by Frederic Heath in the Milwaukee Leader newspaper during 1920-1921. OLD WALKER’S POINT WOODEN BRIDGE? Thanks to an early day fire we have the accompanying view of the old Axtell house and the old Walker’s Point wooden bridge. The fire gutted the buildings west of the old hotel and even caught on the hotel cornice, but damaged it but slightly. It was quite the habit for photographers to get to work in those days when there had been a fire, hence the picture. The hotel center of Milwaukee has moved about a good deal since the earliest days. When the few who visited the town came over the trails the hotels were confined principally to the east and west sides: that is, there was the original Cottage Inn on East Water St., the Bellevue house, at Broadway and Wisconsin Sts., and the Cabbage Hollow house on the east side, all situated close by the end of the Sauk Trail, and the American House, formerly Tavern, over in Kilbourntown. When steamers and schooners began to bring settlers and merchandise, and finally when piers were run out in the lake to save transferring the cargoes and passengers to little tow boats, Huron St. was the big street and the east side had the hotel monopoly. This died away when the railroads came in – or were “built out” from Milwaukee – and the depots were located principally on the south side. 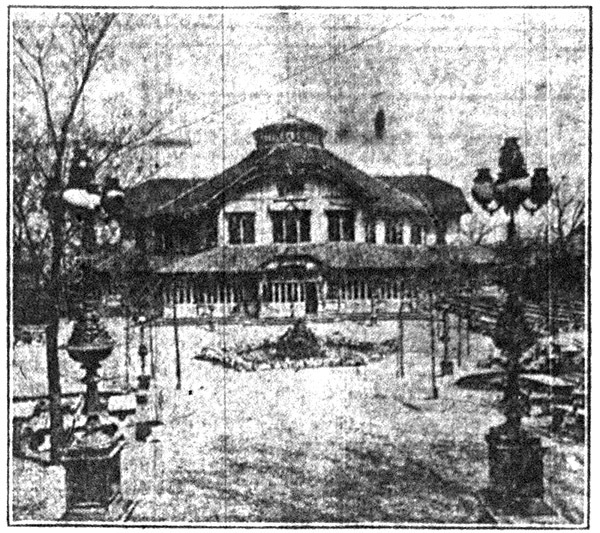 The histories of the day refer to the Axtell house as the “favorite hotel with the traveling public” and there were numerous other south side establishments. The Axtell was built in 1860 and was enlarged in 1872. It was built by William Axtell. He had been the manager of the Clinton house, then the big south side hotel, and later went to California for his health. 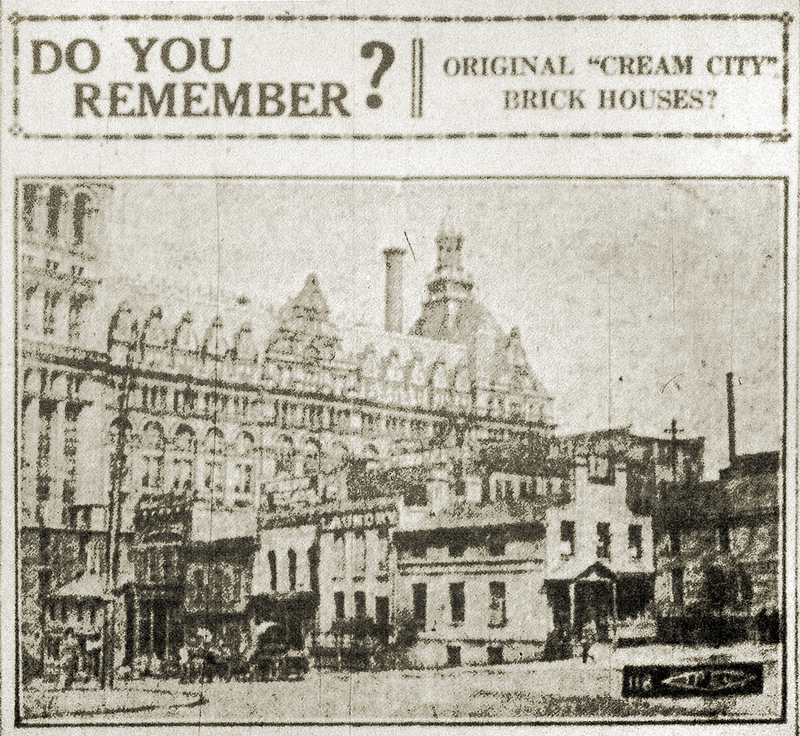 On returning, he joined with Richard B. Ricketson in conducting the Cream City house at Ferry and South Water Sts. Meantime he erected the Axtell Blk., diagonally across the corner, and when the Cream City was unable to accommodate its entire patronage he turned the new block into a hotel. The Cream City afterward became the Ricketson house. When the union depot was relocated on the west side, the south side hotels withered up like mushrooms, and today there is hardly a vestage left. The row of small hotels across from the old depot on Reed St. have been wiped out of existence and replaced by cold storage and agricultural implement buildings. The life and bustle of Reed St. is gone. The old Lake house on Lake St., is no more and the old Metropolitan on Hanover and Florida Sts., was long ago turned into a railway men’s YMCA. The Cabbage Hollow house referred to was as unpretentious as it was early. Cabbage Hollow was, as its name implies, not a gully. It was a gentle depression that deepened as it approached the river and reached level ground at about the middle of Jefferson St., between Biddle and Martin. The origin of its name would appear to be obvious. Do You Remember Newspaper Row? 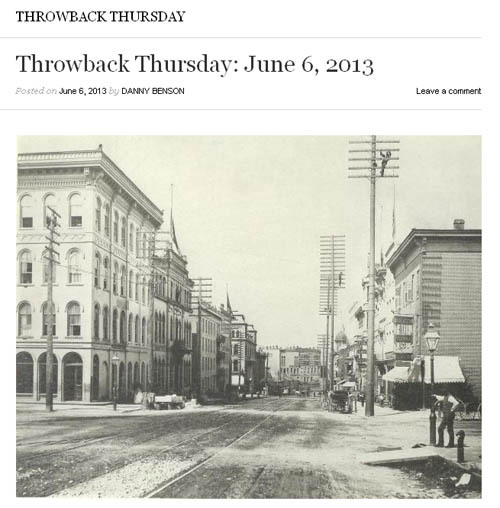 The Milwaukee County Historical Society had a photo on their blog not too long ago showing Mason Street looking west of Broadway taken during the 1880’s. 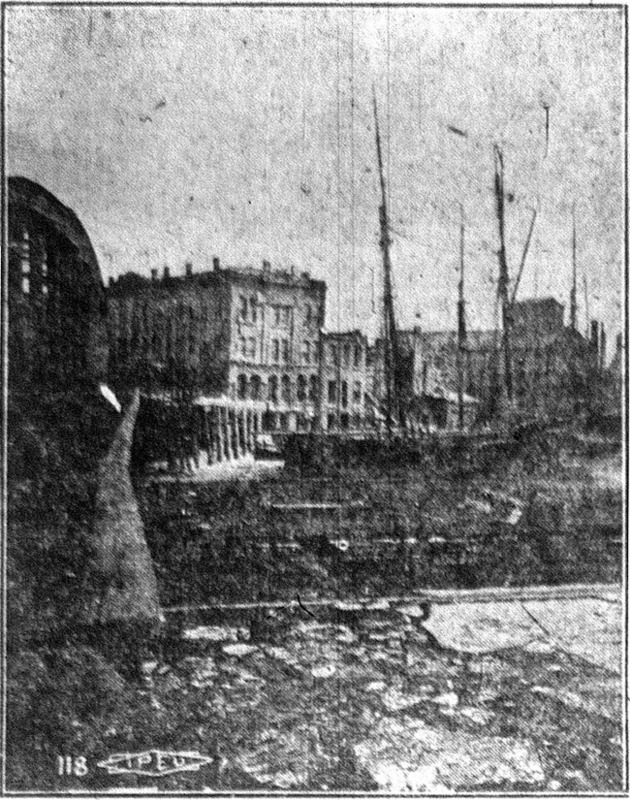 The exact same photo was used in this article from the Milwaukee Leader explaining the history of Newspaper Row. This was another article in the series by Frederic Heath on Milwaukee’s early history. 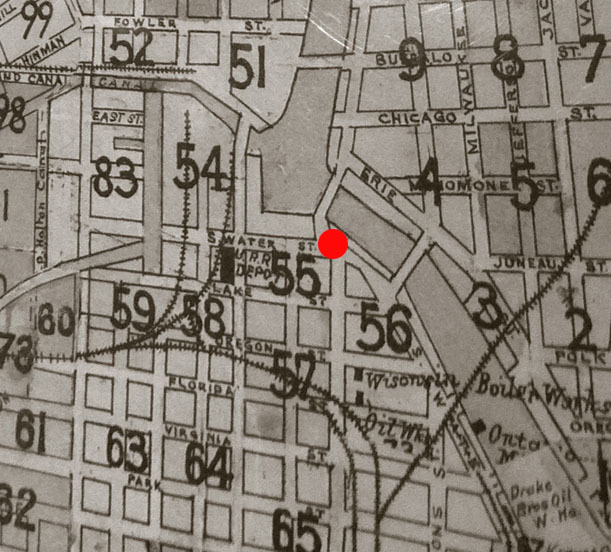 To about 1910, Milwaukee still had a newspaper row. It was located on Mason St., below Broadway. Many newspapers were born there, nursed at the usual terrific expense and then sent upon their way. Some died aborning and some scarcely survived teething time. In the accompanying view, this portion of Mason St. is shown as it looked in the late ’80s. About all that remains intact today is the building at the corner in the left side of the picture, now the home of the Kuryer Polski, and the old Kirby house at the corner of East Water St. Across from the Kirby is he old Brodhead Blk., now replaced by the First National Bank skyscraper. The Kuryer Polski building formerly was the home of the German Herold. The building was erected by the publisher, W.W. Coleman, who was an able man in his line, and built up a tremendous business with many different editions and auxiliary publications. His greatest competition came from the Germania of George Brumder, then published at West Water and Cedar Sts. Eventually the papers were consolidated. Next to the Herold Bldg. is seen the old Sentinel Bldg. In its business office for years one of the head clerks was William George Bruce, secretary of the Commerce Association. Editors and reporters were on the second floor and the printers on the top floor. Across the street with the old Daily News office – not the Daily News of more modern times, but the Democratic organ of which Col. E.A. Calkins was for a time editor. A door or so further east was the old See Bote building, P.V. Deuster’s establishment. A famous newspaper fight of those days transformed The News into the Republican and News, with Horace Rubins as editor, and eventually “got” The Sentinel, the name of which was changed for a time by the consolidation to Republican and Sentinel. From the old Republican and News office, across the street, Dr. E.W. Magan, as editor, issued a small afternoon daily called The Daily Dispatch, but it did not live long. On the same side of the street, across the alley further west, where Marnits the Tailor now is located, there was located the Sunday Telegraph, started by Calkins and with which Col. J.A. Watrous was later identified. The type was set on its own premises on the second floor and the printing done in the basement of the Herold Bldg. A door or two west of The Telegraph Bldg, with the old Freie Presse Bldg, a paper that is now but a memory, along with its editor, whose name was Siegl. Next to the See Bote office was the old Kahlo saloon, a veritable newspaper man’s home, while at the corner, seen at the right side of the picture, there was the old Quiet House of Adam Roth, also a haunt for newspaper men. On the top floor the Press Club had its quarters in those days. The building is now replaced by a high structure. The list of newly born newspapers would not be complete without mention of The Daily Journal. It first saw the light from a room near the corner of The Herold, or Kuryer Polski Bldg., the windows of which appear in the picture. Lute Nieman, former managing editor of The Sentinel, was the editor, and the financial angel was Mike Kraus. Nieman and his assistant, William Bowdish, sat about a long table, grinding out as sensational yellow stuff as their imagination permitted, and the paper had a tough reputation during the time it was “catching on.” How Nieman and Bowdish managed to live has never been explained. Later on, Niemann married into a wealthy family and The Journal became very respectable. Mason St. o’ nights is tame and quiet now, but in the real days of Newspaper Row it was noisy with printers, racing printer devils, clattering mail wagons, boys with handcarts filled with mail bags and reporters darting about or foregathering in the establishments already named. It was the ceaseless clank of old style newspaper presses, and over all the smell of printers ink that is anise to the nostrils of the newspaper man. But all this is gone. Newspaper Row is scattered. The city is big and newspaper methods have changed.